Opening a brick-and-mortar pizzeria has been a lifelong dream for Matt Lyons. 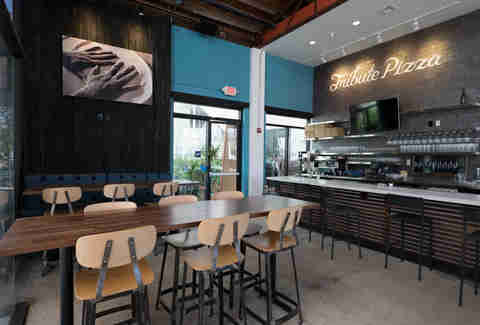 After an eight-month stint in Nairobi where he helped develop a Neapolitan-style pizzeria (his entire travelogue is worth a read), Lyons returned to San Diego to launch Tribute Pizza as a pop-up concept on Pi Day (March 14) in 2013. With his small portable oven and meticulously crafted dough, Lyons regularly set up shop at Coffee & Tea Collective in North Park to sell "neo-Neapolitan" pies, quickly earning him a cult following among neighborhood locals and pizza nerds alike. Now, Lyons is putting his pizza-making skills to work as the chef and founder of a real-deal pizzeria in the heart of North Park. 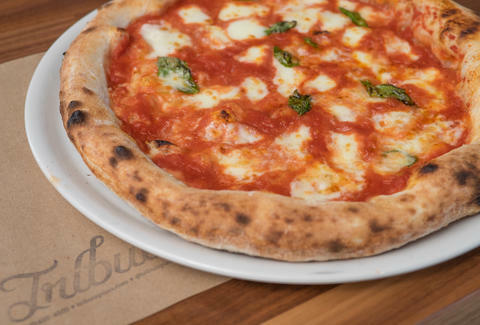 The restaurant’s name neatly sums up the goal of the enterprise: to pay tribute to the world’s best pizzas and pizzerias, including Apizza Scholls in Portland, Paulie Gee’s in Brooklyn, Pizzeria Bianco in Phoenix, and many more. "We’re not looking to create exact replicas or take something and make it our own," explains Lyons. "We want to make something incredible as well as we can." With that mission in mind, here’s everything you need to know about the latest (and arguably greatest) new pizza spot in town. The 3,500sqft building that houses Tribute most recently served as the community post office. Lyons says the current layout is fairly similar to the building’s former life (the counter separating the open kitchen didn't move, and the floors are original), but some elements, like a charred wood wall made from the flooring from his grandfather’s home, are new. Soon, a custom-designed pizza flag will flap (proudly, we assume) atop the flagpole conveniently already mounted on the roof. Tribute has 16 tasty craft brews on tap, but if you’re more interested in wine, it's got you covered with a thoughtful selection available by the bottle or glass. Lyons is particularly fond of the Gragnano, a jammy red with a touch of effervescence that cuts through fatty cheese and olive oil, making it a natural pairing for pizza. There are also two taps dedicated to house-made sodas (flavors rotate, but have included basil lemonade, peach creamsicle, and jamaica with grapefruit). 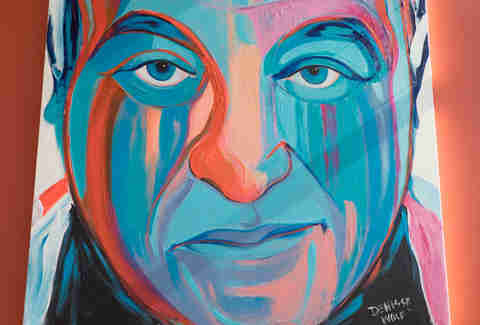 Local artist, Denisse Wolf, created two giant paintings for the space that pay homage to pizza makers and their craft, including an Andy Warhol-inspired piece depicting a can of Bianco DiNapoli tomatoes, and this portrait of Chris Bianco, Lyon's mentor, of Pizzeria Bianco. For many pizza lovers, the margherita pie is the perfect benchmark to judge the quality of any given pizzeria. Here, it’s made with organic Bianco DiNapoli tomatoes, creamy fresh mozz, basil, and primo olive oil -- and serves as a fitting homage to its inspiration, Pizzeria Brandi in Naples. The soft yet springy crust reveals a master at work. Lyons says his recipe yields dough that’s closer to bread dough than most pizza dough. Two key factors that make it taste so delicious are the flour, sourced from Central Milling, and the water, which is vastly improved by a reverse osmosis system that he installed just to make Tribute's unique dough. The pizza dough is also stored in a completely separate cooler from the beer to stop any cross-contamination, so the dough remains as pristine as possible, and the beer can be served as the brewers intended. 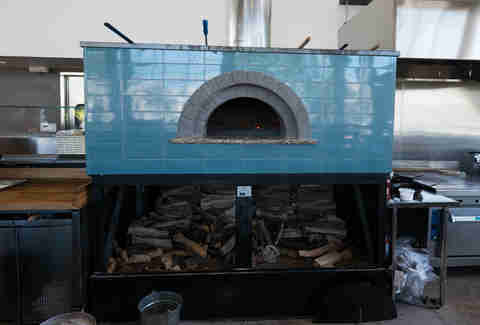 That sleek teal number you’re looking at is a 1,500lb wood-fired Renato oven. It’s right at home in Tribute’s open kitchen, but moving it in wasn’t exactly a cakewalk. Lyons and the crew had to remove three windows, a door, and a piece of the exterior to get the beast inside. 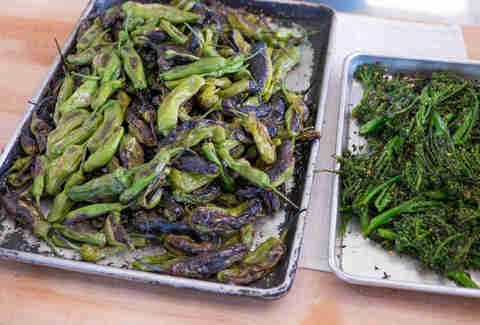 The oven burns fallen white oak and is connected to a pollution control system that turns the smoke into clean water vapor, reducing the emissions and odor by 96%. Lyons says installing a system like this is something he’s always wanted to do. “Burning wood is tough to rationalize, except for it’s the best way to cook a pizza,” he says. “We wanted a wood-fired oven, so we put a lot of effort into mitigating the effects on the neighborhood and the environment." Loaves of focaccia, shishito peppers, brocollini, and cobs of corn also do time in the pizza oven (and reach their peak flavor potential, thanks to the hothothot flames). 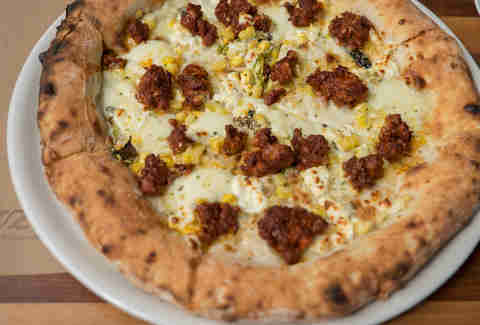 Most of the pizzas pay tribute to other pizzas, except for the Al Pastor: a white pie inspired by Tacos El Gordo with house-made al pastor sausage, panela cheese, wood-roasted corn, and poblano peppers and a touch of Mexican crema. It is, again, obviously delicious. When the owner of a restaurant is vegetarian, chances are good there will be plenty of considerate non-meat items to choose from. 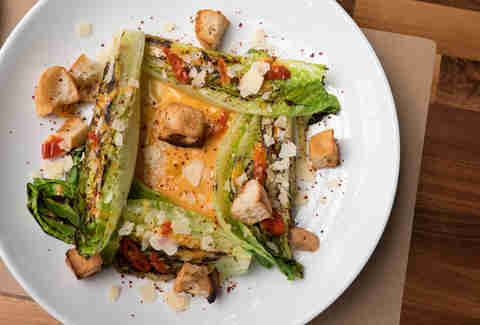 At Tribute, options for vegetarians include several pizzas and the Brutus salad, a fish-free take on the Caesar made with grilled romaine, focaccia croutons, and creamy, savory dressing that swaps anchovies for Calabrian chilies, which introduce a similar briny flavor. 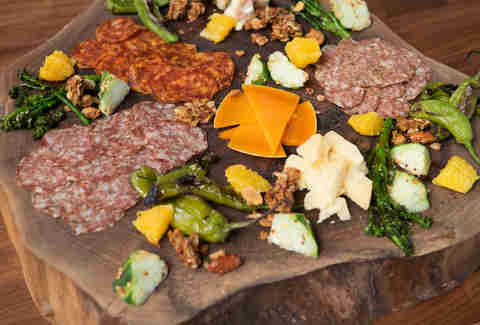 The genius dish is the work of chef Brian LaBonte, who Lyons says is behind some of the more inventive plates. While most of the pizza offerings are static, salads will evolve with the seasons to showcase the freshest produce available. 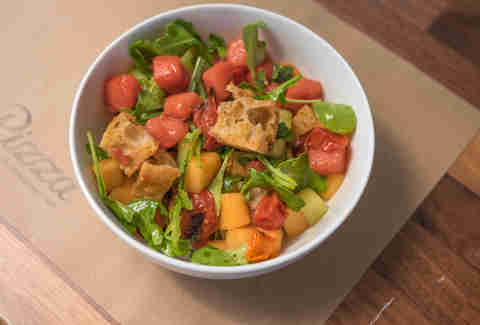 Get this melon panzanella salad while you can. It’s made with sweet cubes of local melon, sherry vinegar-marinated croutons, roasted heirloom cherry tomatoes, basil, and mint. “It’s just a treat,” Lyons says. In the near future, Lyons is stoked to roll out a house-made charcuterie program at Tribute that will see a variety of meats made on the premises. For now, the meat is sourced from elsewhere and is available as part of five-, seven-, or nine-item platters (with cheese and veggies). The largest size (seen above) comes with a full loaf of fresh-baked focaccia with premium olive oil and 18-year aged balsamic vinegar for dipping. As of press time, Tribute is in "super soft opening" mode (closed on Monday, open 5-10pm Sunday and Tuesday-Thursday, and until 11pm on Friday and Saturday), but you'll want to head over there soon -- at least before the rest of San Diego is keyed into the fact that their favorite pizza spot isn't just a pop-up novelty anymore -- it's a bonafide business with a permanent home.